Dorsal (left) and ventral views of Eponides repandus, from here. 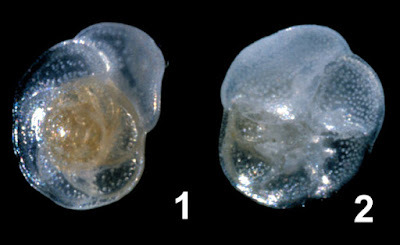 The Eponididae are a group of free-living Foraminifera known from the Palaeocene to the present day (Loeblich & Tappan 1964). Characters (from Loeblich & Tappan 1964): Test free, low trochospiral coil or may be uncoiled; aperture basal or areal, single or multiple, may be covered by plate or spongy material.